Producer Lauren Peters and Hayes Theatre, present CRY BABY, Book by Mark O'Donnell and Thomas Meehan, Songs by David Javerbaum and Adam Schlesinger. Based on the Universal Pictures Film Written and Directed by John Waters. At the Hayes Theatre, Greenknowe Ave, Darlinghurst. July 20 - August 19. CRY BABY, is an American Musical of 2007. It is based on a John Waters film, as was the musical, HAIRSPRAY, of 2002. HAIRSPRAY played on Broadway for 2,642 performances. CRY BABY managed only 45 previews and 68 performances. One was a mega hit the other a mega flop. However, CRY BABY at The Hayes Theatre belies those set of facts. For this production led by Director Alexander Berlage is a great big booming hit - (or, a great big piece of clever persiflage, perhaps?) It concerns the star crossed lovers, Allison (Ashleigh Rubenach) belonging to the pastel 'squares' of a Baltimore environ and the other-side-of-the-tracks vivid 'drape', Wade 'Cry Baby' Walker (Christian Charisiou). Like Juliet and Romeo they fall in love and nothing much runs smoothly until the end. The Eisenhower American Dream culture is being assaulted by a youthful revolution of a claustrophobic reality to the beat of the iconoclastic threat of Rock 'n Roll led by Cry Baby (a Johnny Ray sound-alike, a precursor to the full on Elvis swivelling hips and bombardment of sound), from Turkey Point, who with his 'kooky' (draped) crowd invade and uproot the dullness of his home town - but, not without punitive overload. 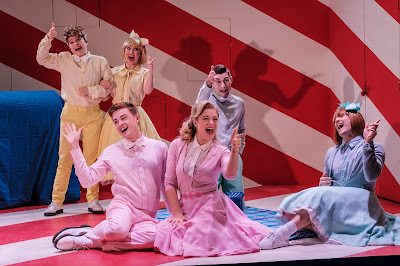 In this production, Isabel Hudson has created a Set Design for CRY BABY that has a bubble gum, candy stick explosion of red and white stripes, booby trapped with wall and floor door flaps for pop-out appearances from a tireless ensemble of incredibly energised 'youngsters', twirling, swirling about in eye-boggling, outrageously conceived Costumes by Mason Browne, some whip smart wiggery (Wigs by Vanity) and Make-ups (Oliver Levi-Malouf). Mr Charisiou (Baby Baby Baby Baby Baby (Baby Baby)) and Ms Rubenach (I'm Infected) are incredibly gifted vocally, and within the cartoonish needs of this genre, give impeccable and well judged performances, that are extremely charming and lively - a secure central core for this endeavour. But, then, so do they all, right across the casting board: Joel Granger, as the sneaky goody-goody villain of the piece, Baldwin (Squeaky Clean); Laura Murphy, the screw loose nutter of the piece - serious stalker, Lenora Frigid (Screw Loose); Alfie Gledhill, the seriously talented 'Mercutio' support to the hero - Dupree (Jukebox Jamboree); and a wonderfully sustained performance of 50's caricature of hypocrisy, by Beth Daly, as Mrs Vernon-Williams - awful but likeable (I Did Something Wrong ... Once). There is a gang of seriously young groupies: Hatchetface (Manon Gunderson-Briggs), Wanda (Amy Hack), Pepper (Bronte Florian) and an Ensemble, led by wickedly 'camp' Blake Erickson, in a series of don't-blink-or-you-might-miss-'em cameos that inspires crazy but disciplined work from Brooke Almond, Hayden Baum, Aaron Gobby and Ksenia Zofi. It is the sheer full-on energy of the production propelled by the gaspingly brilliant choreography of Cameron Mitchell - wait till you see the bravura piece: Jailyard Jubilee! (inspired by Elvis and his JAILHOUSE ROCK -1957?) - and the Musical Direction of Nichols Griffin with a small band of four that takes you by the scruff of the neck and hurls you into the mindless madness of this invention. CRY BABY is not deep. The characters are 2D caricatures. There are no real emotional demands. 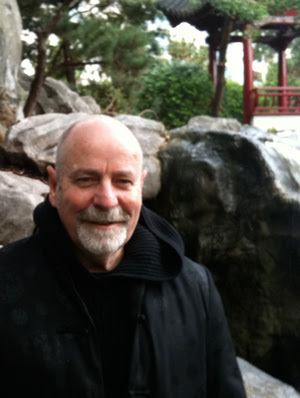 The material aims at a 'campy' soft satire. Or is it cleverer than I think - disturbingly clever? Hmmm? WHATEVER! There is talent galore on stage that serves the material impeccably and did overwhelm me - you. Well, you were cheering, weren't you? Director Alexander Berlage has this year given Sydney: THERE WILL BE A CLIMAX, at the Old Fitz; HOME INVASIONS, at The Old 505 and now this. He has an ability to weld a company together and package a bright contemporary gleam to his work, for Mr Berlage is also an extraordinary Lighting Designer. For like CRY BABY these shows had a most pleasing aesthetic and energy - though, nearly all surface and, mostly, little meaningful content. Or, if it does have content, is it just overwhelmed with enthusiastic glitzy 'show-biz' indulgences? Is Mr Berlage aiming at entertainment of a startling pleasure that reduces, perforce of his skill, the works to being more, than less, empty headed in affect. It was more than a little creepy to hear, after the horrible 'journeys' of murder, arson, deceit, injustice, persecution and lax moral compasses, that are the spine and activity of nearly all the characters of this 'satiric' story, to have a final song belted, optimistically, out to us from an American Broadway musical that NOTHIN BAD'S EVER GOING TO HAPPEN, in the future, without thinking of the U.S. of A. and the Trumpian tweets that invade our grip on the world, nearly everyday. Is it enough to have a good laugh at a large part of the American Dream gone to smash, dragging the rest of us to hell with it, to just have a quick image of a multi-coloured Mexican hat been squashed underfoot into one of the trap doors to oblivion to assuage the celebration at the end of CRY BABY? I don't know. I felt my ecstatic 'rush' at the end of the show might have been what Nero felt as he played his violin while Rome burned down around him. The terrible question is: Do I regret the time spent with this American 'propaganda' and have any guilt that I actually loved, loved, loved it? And, now recommend it to you? CRY BABY was a late (hasty?) substitution for the first expected production of AMERICAN PSYCHO, after its rights were not available, for this team at The Hayes.